On May 9th, the State Board of Education had their meeting in Auburn (press coverage in the SunJournal and at WCSH6). The Board often has their regular meeting at a school, spending the morning in a workshop and the afternoon in their business meeting. 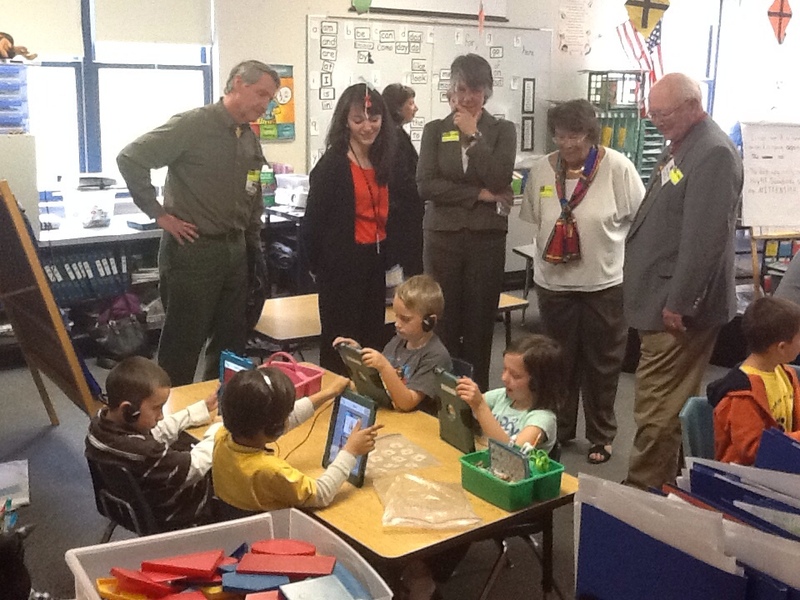 They came to Auburn School Department because they wanted to learn more about teaching and learning with technology. We used the morning workshop to have them visit technology-using classrooms at our middle school, high school, and one of our elementary schools, then return to Auburn Middle School for a debrief and lunch with some of our students. Good teaching and learning with technology doesn’t happen on its own. It doesn’t happen just by giving teachers laptops or tablets. It takes deliberate leadership, leadership that is a team focus on positive pressure and support, teacher practice, funding, partnerships, resource management, branding and buzz, and PD for paradigm shift. Some view technology as a luxury schools can’t afford. And yet technology is prevalent in nearly every sector and part of life outside of school. If we want students to think school is relevant to their lives, then we need to use tools for learning that they see in use outside of school. Technology is just a tool. It doesn’t replace teachers. In fact, using technology well takes a good teacher. We won’t ever improve learning by simply handing technology to students. But when a good teacher hands technology to students with a good activity, then learning can soar. Very few of our teachers grew up as students in classrooms where technology was a teaching and learning tool. It is unfair to expect teachers to implement technology well if they have not experienced it’s use as a learning tool themselves. We need to provide lots of support to teachers so they can get good at teaching and learning with technology. That support needs to include identifying models of effective use, classroom visits, trainings that model effective use, access to resources, a safe environment to try new things (and maybe fail), and a little professional hand holding. Whether we have technology available in the classroom or not, teachers need to compete for student attention more than ever before. Students have access to much more information outside of school than when we were students. If teachers are to remain effective and schools are to remain relevant to students, then we need to focus on engaging students, keeping things interesting, and making learning meaningful. Young children are adept at using technology, and there are many great technology-based apps and resources available for a quality early learning or primary grades program. Schools known for effective technology rich environments are good at identifying the right learning tool for the learning target. And even though they use technology widely, they would never use technology exclusively. Students still have teachers, read books, create art, play outside, write with pencil and paper, toss a ball, etc. This entry was posted in Technology for Learning and tagged Auburn, Leadership, PD for Paradigm Shift, Student Engagement on May 16, 2012 by Mike Muir.